Situated in the heart of Sherwood Forest, home of the legendary Robin Hood, The Forest Lodge is an 18th century coaching inn owned and run by the Thompson family. 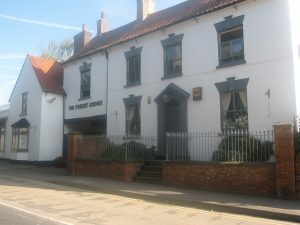 Over the years, it has become a multi-award winning establishment : awarded ” best venue in 2005 ” and “best service 2011 ” by local businesses; the local CAMRA “Pub of the Year” 2010,2011 and 2013 ; “Pub of the Season” for summer 2011, winter 2012 and spring 2015; Trip Advisor Certificate of Excellence for 2013, 2014 and 2015. Additionally, The Forest Lodge is accredited to four star standard with the AA and is rated under the National Accessible Scheme and has appeared in the Good Beer Guide since 2007. The building has been lovingly restored and refurbished to provide the visitor with a warm and homely base from which to explore the unique attractions of this fascinating and historic building. 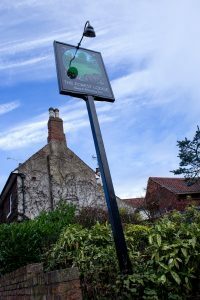 The village of Edwinstowe itself was named after Edwin, King of Northumbria, and it literally means “the holy place of Edwin.” It is believed that Edwin died whilst fighting a battle against King Penda of Mercia just a few miles from here in 633 A.D. In his honour, a church was built on the site of the present day St. Mary’s church where, according to legend, Robin Hood married Maid Marion. The church can be seen from the windows of many of our rooms.